“The Stone Age didn't end because the world ran out of stones. The Oil Age will end, because we will run out of oil. As a polymer clay artist, I create artifacts of mind, my visions and experience with other cultures, ethnobotanical art that will endure long after the oil has run out. Oil has vandalized this planet. I'm trying to do something that leaves behind a carbon footprint of beauty rather than destruction. And, as a fimo artist who works exclusively with polymer clay, give my chosen medium the nobility it deserves. 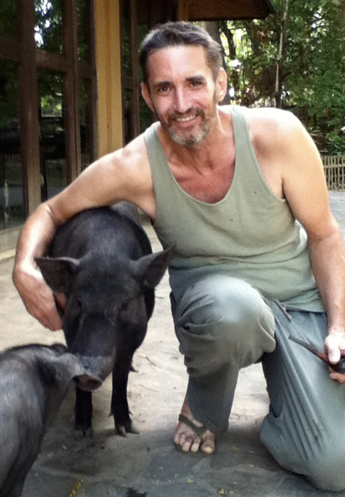 Pictured here in front of his studio with pets Lincoln and Francine, Jon lives in Bali with his chickens, cats, dogs, and a 2.5 metre rescued python called Fluffy.